If you don’t know him yet, he’s the guy who had defeated the world’s number 2 Rafal Nadal in the Australian Open 2008 with an emphatic 6-2, 6-3, 6-2 win. What is going on here? It was so obvious that Nadal’s hits and returns look so slow and short compared to Tsonga’s which made him paid the price by running and tumbling all over to court. Good drives, good volleys, good drops, good interception, anticipation and insticts, Tsonga was really having a great night. I bet Nadal will be SO surprised why did he even loss to this frenchman here. Please have a look at him. He looks like Muhammad Ali and jumps around like a monkey with his two thumbs pointing to himself eveytime he wins. He’s one good tennis player and definately was the better player to win the match. Whoever emerge as winner in the other semi-final match (Federer or Djokovic) will be relatively delighted with this result because on paper, nadal is a much tougher opponent to nail down. But yet Tsonga, first time into a grand slam semi finals and now finals has certainly a lot more of quality to show us in the finals and should not be taken lightly. We will just have to wait and see. 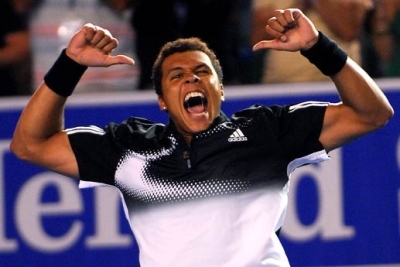 Personally, I think Tsonga found his rhythm and managed to sustain to this far. But we’ll see if he can take this Grand Slam and perform at the same level throughout 2008.